​Working on the Kansas Leadership Center building provided us a lot of opportunities to really help the client achieve their goals in their new space. One such opportunity came about based on the client’s knowledge and appreciation of our role with Kansas State University. In both projects, we were asked to assist the client with art selection and location. Early in construction on the Kansas Leadership Center, the client asked us to provide input for their art consultant, who would be selecting the artwork for the building. As the stud framing was starting, we met with consultant Steven Gleissner to help him understand the various spaces. We met multiple times, provided plans and marked key locations, dimensions, lighting types and other important considerations to ensure success in selecting the art. As we worked with Steven, we made some adjustments to the building. For example, one large, curved wall was redesigned by our engineers to support a heavy piece of ceramic art that measures approximately five feet by 20 feet. When it came to the mobile in the open stairwell, Kansas Leadership Center commissioned artist Christopher Gulick. Christopher gave KLC two options on the mobile: a black and red piece or a silver and gold piece. Our recommendation, which hangs there today, was silver and gold as it was complimentary to the building’s neutral colors and addressed the client’s concern to not be too overt. Next, I worked with Christopher to set dimensions for the sculpture for the two-story atrium space with stadium steps. We considered and studied radius points, the rotation of the piece and clearance to the walls and necessary structural supports. Engineers in Opus AE Group then created hanging supports that coordinated with the sculpture’s swivel connector device, and Opus Design Build installed them. Because we took the extra time to provide comprehensive services, in the end, everybody was happy about the selection and placement of the many pieces of artwork. 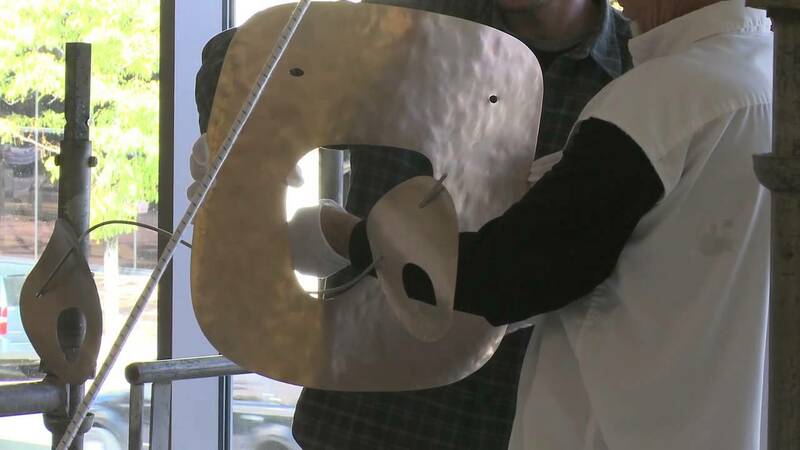 Above: This video shows artist Christopher Gulick assembling the mobile in the stairwell at Kansas Leadership Center.